Cabinet: a place to hide dirty socks if you’re too lazy to go down to the laundry room today. Also: group of elected MPs chosen by the Prime Minister to take the blame for various bad things that happen in different areas of the government, e.g., Culture, Law n’ Order, Money, Senate, etc. Senate? What’s that? Don’t ask. 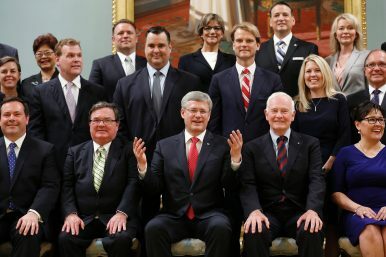 Canadian PM Stephen Harper and his July 2013 reshuffled cabinet. Wait a minute. You say dirty socks are hidden in “dirty sock drawers,” not in “cabinets”? Oh well, as they used to say on Saturday Nite Live, never mind. And keep your “drawers” on. The point is the dirty socks, not the furniture. Shuffle: a normal maneuver in gambling where the dealer takes a pack of cards and rearranges them rapidly to give the impression that all of the cards have been randomly reordered. Shuffle, cabinet: a standard maneuver where the Prime Minister periodically takes a pack of cards consisting only of Jokers and rearranges them randomly to give the impression that all of the Jokers have been thoughtfully, carefully and intentionally rearranged. Whether it’s dirty socks or Joker shuffling, Canadian Prime Minister Stephen Harper’s mid-July 2013 cabinet shuffle is probably not very important. This is one of those cases where the old saw at the ballgame, “You can’t tell the players without a scorecard. Get your scorecard here! Scorecard! Scorecard!” doesn’t apply. It really doesn’t matter whether you can tell the cabinet players or not. The guy with the ball is Stephen Harper and the other players only get to play with it at his pleasure. No, the real defining mystery is why Canadians keep electing Harper and his Conservatives, and how this long-serving PM manages to run the country with no more than a 40 per cent plurality at the ballot box. One reason is that the 60 per cent of Canadians who don’t vote for Harper are apparently not smart enough to figure out how to form a coalition and create a government. Another reason is that opposition political parties, instead of relying on ideas, rely on supposedly charismatic politicians with fabled names (e.g., Justin Trudeau). Naturally, we would never want to besmirch the myth of the wisdom of the People, and therefore we won’t suggest that another reason is that a lot of folks are just plain ignorant. You notice that we haven’t wasted our breath or your time by discussing each of the names, picks, shuffles and speculations involved in this game of Insider Baseball. You’re most welcome; this dictionary aims to please.